My friends know that I have a passion for knitting. 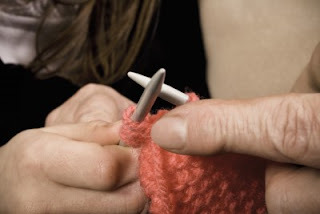 I knit almost every day, often items that are very complex. But it doesn't end there. I'm also passionate about teaching knitting classes and designing. I did a lot in the past when I lived in the US but I've been away from it this past year. I don't usually put much stock into horoscopes, unless it says something that I like. I like the one I read today: " Your strong passion for what you do could lead you to more success. Get your message out there. You might find allies where you never expected." It's going to take a few months to get all my "ducks in a row", but then I'll be looking forward to the next step ... and hopefully finding some allies, perhaps in the form of shops or events that are looking for instructors.